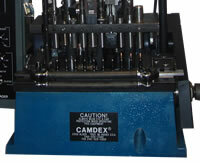 The Camdex 2100 Series Loading Machine is speed adjustable to 4400 cycles per hour. The 2100 series will stop for and indicate on the touch screen control if any of ten faults have occurred. The 2100 Series features a total redesign of the control and monitoring system to enhance operator use and make fault correction fast and easy. Click To Enlarge The 2100 Series Loader can produce ammunition in any NATO or commercial handgun caliber. 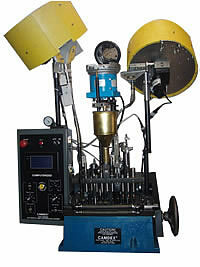 Conversion packages are available to allow the machine to load more than one caliber of ammunition. It is shipped complete in one caliber. As with all Camdex products the 2100 Series Loader is backed by a one year warranty on materials and workmanship. Our state of the art control system monitors 10 functions simultaneously to ensure that the finished ammunition will be of the highest quality. 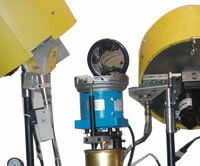 An automatic 14 inch case feeder and a 14 inch variable speed bullet feeder are standard equipment. The automatic primer feed system is assisted and monitored by an Air/Vacuum system. CASE LEVEL - Low case level in feed tube automatically shuts off machine. CASE PROBE - Checks for case feeding, foreign particles and live rounds. PRIMER POCKET PROBE - Mechanically checks the primer pocket for ringers. PRIMER SLIDE - Shuts off the machine should a primer jam occur due to dirt or high anvils. PRIMER FEED - Shuts off machine should it run out of primers. POWDER PROBE - Checks for both high and low powder charges. BULLET FAULT - If the machine fails to feed or runs out of bullets, the machine shuts off. VACUUM SYSTEM - Checks vacuum pressure to assure primer feeding. CURRENT SENSOR - Any increase in preset amperage shuts off the machine. The Camdex 2100 Series Loader has automatic primer feeding to improve production rates and simplify the loading process. Just put up to 400 primers in the bowl at one time and the feeder will supply the machine automatically. The primer feeder is controlled by a fiber optic monitoring system which allows approximately 60 primers into the feed tube. When the primer level falls below this amount the fiber optics will turn the feeder on. When the level has returned, the primer feeder will shut off. The feeder will also orient the primer to feed with the proper side up. The priming system is also monitored by a vacuum system which will shut the machine off should the machine run out of primers. The vacuum system is monitored by the SmartPanel, which informs the operator of the location of any of the monitored faults. Click To Enlarge The Camdex 2100 Series and the Camdex 2200 Series Rifle Loader both use the SmartPanel and make the machines extremely user friendly. The electric current is 120 volts/60 Hz (also available in 220v/50hz) with 24V DC control circuitry to all external micro switches. All of the controlled functions of the machine are easily monitored on the touch-sensitive screen directing the operator to the location of any fault that occurs. The 2100 Series control panel not only monitors 10 machine functions, it also provides easy access to all of the feeder controls. The vacuum pump is controlled through the PLC by way of the touch-sensitive screen and the power and speed controls for the case, primer and bullet feeders are located on the face of the panel. The Camdex 2100 Series Loader has 11 stations in line. It sequentially moves the case from left to right. Each station performs a process or inspection for the succeeding station, until the cycling of the machine produces a finished cartridge with each cycle. After the case leaves the case entry tube it moves to the first station where the machine probes for a case with nothing inside of it. This starts the progression as follows: size and deprime, primer pocket probe to assure the entire primer has been removed from the primer pocket, prime, powder drop, powder probe (for over and under charge)and case-mouth bell, initial bullet seating, finish-depth bullet seating and final sizing, crimp and bullet check. When the round exits the machine it is ready to fire.